Title: 'Asiae Nova Descriptio'. Latin text to verso. 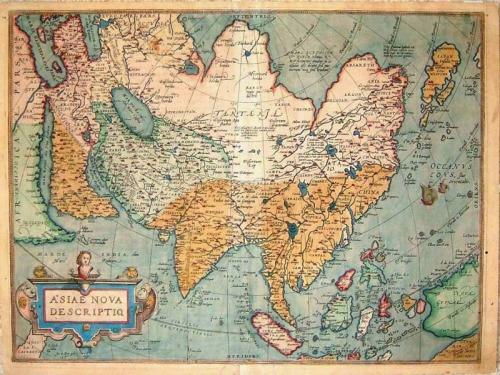 A fine general map of the Continent of Asia from Ortelius' important World Atlas "Theatrum Orbis Terrarum". Includes Japan in an almost recognizably modern 3-island form, but not include Korea. This is the rare early plate. The condition is good with minor toning in the margins and an unobtrusive centerfold repair and reinforcement. There is a small tear in the top margin that crosses into the image area and a couple of small pin holes. Thiese can be repaired.